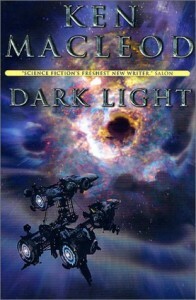 The sequel to “Cosmonaut Keep” is 2001's “Dark Light”. The plot is simpler this time, there is only one plot thread with little mention of Earth and all the action takes place on the planet of Croatan, the nearest planet to Mingulay. Matt and Gregor Cairns, along with their other companions, arrive in orbit around the (mostly) human-populated planet. They find a planet in the middle of a transition from a feudal society to a 20th Century-era industrial economy, complicated by the presence of a large population of primitive tribes in the hinterlands, and the frequent visits of the comparatively cosmopolitan interstellar traders, who have travelled from the relatively advanced planet of Nova Babylonia on alien starships. The new arrivals make contact with the asteroid-inhabiting Gods in the Croatan system, some of whom warn that their fellow Gods' intentions may not be entirely benign, and may be part of a millennia-old war with another alien species. After the local authorities prove obstructive, Matt and his companions are faced with the question of whether to use their superior knowledge and superior technology to meddle with the political situation on Croatan. Eventually, they come to believe that the only possible solution is to join with the working-class rebel movements on the planet to challenge the bureaucratic Port Authority that runs the planet's main city. However, not all of Matt's companions – principally the former cosmonaut Volkov - agree that he is trying to bring about the right changes. This book is simpler than any of MacLeod's other books, although it still packs in quite a lot of politically-centred discussion the plot is very straightforward and it doesn't have the surfeit of ideas that can make some of his other books slightly daunting – if satisfying – to read. The plot works quite well, but it isn't terribly memorable - although it is entertaining. One small irritation is the use of a present tense for Matt's viewpoints, which is a bit disconcerting and seems a pointless difference from the style of the rest of the novel. In summary, an entertaining fast-moving book that doesn't have the ambition of MacLeod's other novels.